When you think about making your life easier, one of the first thoughts that excite your imagination refers to the magical solving the problems. Well, Swiffix cannot solve all the problems, appearing in your life, but it takes the part that goes with distracting worries like home maintenance. Sounds promising, isn’t it? Great ideas are simple, and Swiffix is one of such. 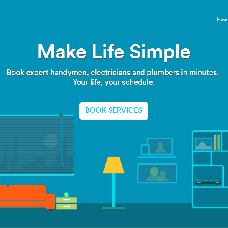 It's an Uber-like app created for handymen services. It allows users to place orders and find required specialists in fast and easy way.